Our Tie-on cable labels provide the perfect labelling solution for cable bundles and larger data/electrical cable installations. 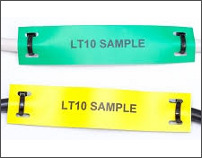 The LT10 label has been designed to withstand the harsh environments that can sometimes cause problems when considering labelling. Our Tie-on labels are supplied on A4 sheets and printed using a standard office laser printer and Sharpmark's FREE Online Labelling Software - no need for additional spending on printing equipment. Each A4 label sheet is perforated down the middle allowing users to print half a sheet and save the other half for use at a later date. Suitable for a variety of applications and cable diameters. Printed in seconds using a standard office laser printer. Made of Polyester providing a durable, UV and water resistant label. Label Material: Matt polyester, laser printable.